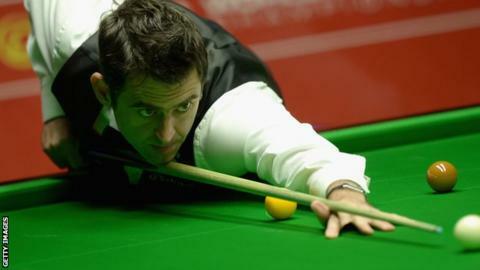 Ronnie O'Sullivan edged closer to a sixth World Snooker crown as he took a 10-7 overnight lead over Mark Selby. Play resumes on Monday at 14:00 BST with the Rocket needing eight frames for a third consecutive Crucible win. At one stage it appeared as if O'Sullivan would run away with things after dominant breaks of 131 and 87 in the 14th and 15th frames. But battling Selby claimed the final two frames of an intriguing second session. Just as he had in the first session, O'Sullivan won the opening three frames of the second, although neither player was at their free-flowing best early on. Selby went on to win the next two, with a 55 break in the 12th before an O'Sullivan foul on the final green had the Leicester potter dreaming of a way back in at 8-5. But that was the cue for O'Sullivan to turn on the style by winning the next two frames with ease in a whirlwind 20-minute period, which included his 12th century break of the tournament. It appeared as if Selby's exertions in Saturday's marathon 17-15 victory over Neil Robertson would catch up with him. However, he showed his trademark battling qualities and clinched the 16th with 58 and then the final frame of the day with 62, his two highest breaks of the match, to remain in contention. The world number three was earlier left to rue a poor miss when closing in on 4-4 in the final frame of the afternoon session. The "Jester from Leicester" failed to pot a ball in the opening frame and then O'Sullivan took advantage of some poor safety shots to wrap up the second, and then third with a 102 break. But Selby came back into things by winning two tactical frames either side of the interval. A break of 63 saw the Essex player take the sixth frame but a couple of uncharacteristic poor safety shots in the seventh gave his opponent the chance of going into the evening session all square. He looked on course to level when fluking the final red, but a poor miss on the subsequent black gifted O'Sullivan the frame.